The Entrance fee for adults is R65.00 and for children R50.00 whilst kiddies under the age of three go in for Free. Conventional bait rods may be hired at R45-00 (includes a ball of bait). An annual membership is available for the more serious fisherman. The fees for single membership is R980-00 per year and for a Family (2 rods) it is R1300-00 per year. Our operating hours are; from Tuesday to Fridays 07h30 - 17h00 and on Weekends and Public Holidays from 07h30 to 18h00. CLOSED MONDAYS (except on Public Holidays). If you are looking for a venue for your child's next birthday party look no further! We have Birthday Party Packages; Afternoon Fishing Outings; a beautiful Swimming pool and Playground Area; a Tuck-shop and Braai & Picnic Facilities. During school holidays we run a holiday program, where kids can be dropped for the day and we will take care of them and supply a nourishing lunch. Should you be interested in any of the above, feel free to phone Kim Kendal at 083- 462-2779 to inquire about relevant cost and make your booking. Our Country Restaurant “The Anglers Arms” is the ideal venue for Weddings, Special birthday parties and a multitude of other social functions. We specialise in all-day breakfasts and a number of light snacks to satisfy those hunger pangs while you enjoy your day away from the rat race. Please note that no alcohol may be taken onto the premisses, as we are fully licensed. 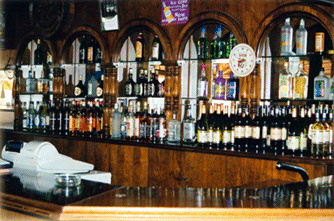 You are able to purchase your drinks at very reasonable rates from the Lapa or from the Bar inside the restaurant. 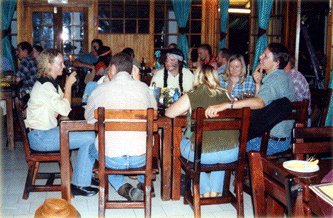 Restaurant hours are from 08H00 to 17h00. Need an invitation for your child’s party at Footloose Trout Farm then you can print it here.